Images of winter monsters are usually reserved for blizzard filled nights when bedtime anxiety makes its sneaky debut. However, what if there is a monster that could fill anyone’s winter, day or night, with twirly, whirly, glittery mounds of joy? Well, I have the coolest project for you. It’s a super-duper frosty good one. Every grown-up and kid who sees these scruffy, wacky wonders, can’t resist giving them a good old shake. They are 100% adorable, easy to make and delightful to give. They do get lonely so make sure to make a whole bunch. Top them on presents or tie them on a sweet little tag to give as a gift. Anyway you present it, every little beast in your life will enjoy making them or be delighted to get them for some winter fun. Note: The directions below are for one (1) Yeti pencil topper. However, it’s easiest to buy supplies in bunches and yards. You will have supplies for lots of pencil toppers. Step 1: Cut the fur per the Yeti template found here. Place the faux fur, fur side down on a work surface with the top being the short 2.5” inch side. MAKE SURE THE FUR IS POINTING UP. Place a line of glue on the two longer 3.5” sides. Align the top of the pencil at the top of the fur and push the pencil into the glue on the left side. Step 2: Roll the fur tightly around the pencil and tie the ribbon tightly to the base of the fur. Step 3: Use the FREE Yeti template found here to cut out an oval face and horns from the felt. Glue each piece to the fur. 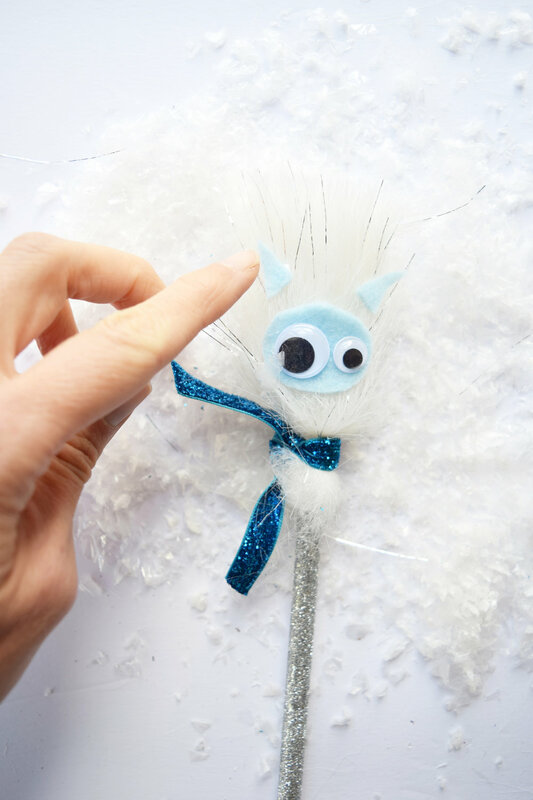 Glue the googly eyes to the blue felt. Step 4: Let dry overnight, add a tag and give it to all the sweet little monsters in your life.